In 2005, we had an amazing trip to Italy, starting out with three days in Rome and continuing on with an incredibly luxurious cruise in the Western Mediterranean on the Radisson SS Voyager. Each day on the cruise included a stop that would’ve been an adventurous vacation in and of itself. As it was, we were sometimes forced to make a decision between one of several potentially once-in-a-lifetime options. The first port-of-call was one of those moments. Waking up to the sunrise coming over the mountains surrounding the Italian port town of Sorento, we had already made the first of our several tough choices for this cruise. While Kathy and her parents wanted to see the beautiful sights of Positano and the Amalfi Coast, my historical wanderlust made the only decision possible for me. See all of my Pompeii photos here! Meeting the group of (previous to this excursion) strangers from the cruise that will be going to Pompeii with me for the guided tour, we board the small tender that takes us from Voyager to the waiting dock. As we get closer, some of the details of the homes along the cliff come into view – striking that ever-present desire for me to go explore them, too. Alas… no time this visit. Perhaps another time. Boarding the bus at the base of the hill, we drive up the narrow street from the port, turning left and north towards our destination. Weaving between the already-busy town of Sorento, we eventually come out onto the coastal road that has the Mediterranean on our left side and the rising foothills on the right. Suddenly, we plunge into an extended tunnel that cuts through the base of the Monte San Michele. Emerging from the tunnel puts us at the extreme southern end of the area that contains Naples and more importantly the imposing sight of Mt. Vesuvius in the distance. Our bus parks in the lot and discharges us to our tour guide, Antonio. He is every bit as engaging and entertaining as a tour guide could possibly be. He keeps us moving, tells interesting and humorous stories throughout the day, and provides a great introduction to this archaeological wonder. In reality, though, at the end of the day, he has only whetted my appetite to return here again one day. But for now – it’s time to enter. Volcanic ash is still seen against the outer walls, piled there to be removed by some future team, but had once covered this entire area up to 20 feet deep when Vesuvius raged. There’s no way to visit Pompeii without knowing (or being told of) the events of late August, AD 79. An already powerful presence rising to the north of Pompeii and southeast of Naples, Mt. Vesuvius dominated the horizon of the early millennium. 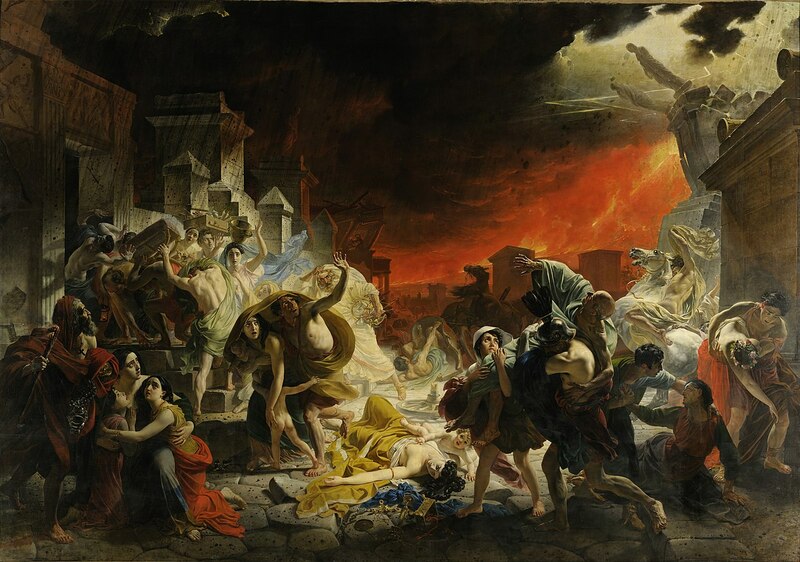 There had been warning quakes a decade or so earlier that had left damage to Naples and Pompeii. These increased in frequency as Vesuvius raced towards its ultimate massive eruption. We know of these details because of the writings of Pliny the Younger, the only eyewitness to leave a surviving document of the events. Broad sheets of flame were lighting up many parts of Vesuvius; their light and brightness were the more vivid for the darkness of the night… it was daylight now elsewhere in the world, but there the darkness was darker and thicker than any night. I can only imagine the horror felt by the ancient Romans upon seeing this massive event rising above them, and then descending onto their homes with fire and hellish debris. There have been several famous paintings attempting to depict this, but the reality had to have been far worse. After an introduction from Antonio to the entrance we were taking, some of the houses we were seeing on the entrance, and more than a couple “jokes for the tourists”, we exit the Via Marina into a Roman Basilica. This long hall, with numerous columns along each side, ended with a raised columned platform. Antonio said that this was used for various government and judicial matters. It certainly looks impressive and quite official. The individual column bases that survived the explosion and subsequent deluges of ash and debris still stand in rows leading to the official platform. The “open end” (slightly ironic, given that the entire excavated structure is open to the sky and sides) leads out into the Forum Pompeii. This, like the design of other major Roman cities of that age, was the main square of the city and cart traffic was prohibited there. It was the heart of political and religious life, surrounded by religious, civil and commercial buildings. Stepping out into large courtyard area, many more restored columns are present, giving a sense of a covered awning and a large open central area. These columns, uncovered from the volcanic ash, remain as impressive today as they must have been almost 2000 years ago. Vesuvius rises impressively behind the far end of the Forum square. Given that the Forum layout doesn’t track strictly “north-south”, it seem apparent that the Forum and several of the major streets in Pompeii were aligned to give a direct (and really cool) view of Vesuvius dominating the horizon. Thank you Google Maps for making this obvious — technology FTW!! Antonio takes us through several buildings and areas immediately off of the Forum, including the Macellum (or marketplace). It was here that I loitered on the edge of our group, fascinated by some of the archaeological artifacts behind a semi-secure wire fence. Some were obviously cataloged neatly into bins, while others (pottery and the like) were leaned against each other awaiting classification and some future evaluation. My first exposure to some of the human remains of Pompeii was here … and was a bit of an unsettling event, as previously – I’d only seen the plaster casts (more on that later). These were completely identifiable skeletal remains (click at your own risk, sorry) – stored in trays with the extracted ash still surrounding them. Leaving the Forum area, Antonio leads us down the heavily cobbled Via del Foro (Forum Way) through an imposing archway, and into the more “residential” area of Pompeii. As noted before, Vesuvius rises in the distance, giving a beautiful view down this main thoroughfare. The streets are markedly noticeable for a couple of things. First, there is a nearly two-foot height difference between the roadway and the walkway. The well-worn roadway shows clear evidence of many many years of carts being moved along, both horsedrawn or otherwise! The thing I find most interesting about the roadway, though, are the stone crossing blocks that allow pedestrians to move from one side to the other without “dirtying their feet” in what must’ve been muddy (and worse) conditions on the roadway. The gaps between the stones would have allowed cart wheels to move between them. All in all … a rather elegant solution! Wow … so much to write about here. I’ve seen (both before and since) numerous photos and television shows about the homes and the amazingly preserved murals, but being able to see the vibrant colors and such well-preserved detail. It’s definitely a Time Machine into the past… and somewhat overwhelming to think of the loss while looking at the beautiful murals. Moving through various homes, Antonio does a skillful job of pointing out not only the “visually wealthy” aspects of the homes – beautiful and delicate hand-laid tile mosaic flooring, but also the more basic aspects of every day life (kitchen and bathing). The homes have names that have been added by historians, based on murals and other findings within the uncovered dwellings. One of the most beautiful and striking is the “House of the Faun”. The “faun” is the mythical “Satyr” (half man – half goat) creature, of which there was a bronze statue in the entrance to the home. There is also a very well-preserved and beautiful mural still prominently visible within. Other homes have large and expansive entry gardens, including large fountains – used to both impress and potentially intimidate visitors with the owners’ wealth. We visited several other homes throughout our brief visit, but looking back at the overall Pompeii layout via various websites (and the ever-useful Google Maps), it’s clear that I had but the tiniest taste of what was to offer. I would easily be able to spend a week here, and never see the same thing twice. That pull to return to Pompeii is strong. I’ve purposely left this section to the end of this blog post, and for good reason. It’s the most somber aspect of the entire visit. Usually, with visits to historic sites, even those that may have had tragic events that surrounded it, there are usually not the stark and very visible reminders of the human lives that once thrived in that place. Pompeii is unique in this aspect, for when Vesuvius covered the city in so much volcanic ash, so many citizens were instantly and dramatically killed. During early excavations of Pompeii, voids in the ash layer had been found that contained human remains. In 1863, Italian archaeologist Giuseppe Fiorelli realized these were spaces left by the decomposed bodies and devised a technique of injecting plaster into the voids to recreate the forms of Vesuvius’s victims. Once the plaster hardened, the ash could be removed, and hauntingly lifelike figures were uncovered – showing the different ways these Roman citizens met their ends. Some of them are heartbreaking – showing the agony of the final moments. Some of them are almost calmly laying down – perhaps overcome by the volcanic fumes. But all are a stark reminder of the powerful events that took place in 79AD. My short visit to this incredible bit of history comes to an end *far* too soon. I don’t know if I’ll ever make it back here – but I want to. The time I’ve spent in Pompeii has just magnified the things I’ve read and seen over the years. But, like everything else I’ve been writing about — SEEING AND EXPERIENCING these sights that our fantastic planet has to offer dwarfs any simple book, website, or television show. “Feeling the history” is a real thing. Get out there and feel some history. We went to Pompeii a few years ago, too. I loved seeing the murals and the mosaic tile floors. Thanks for sharing. I look forward to your next journal.